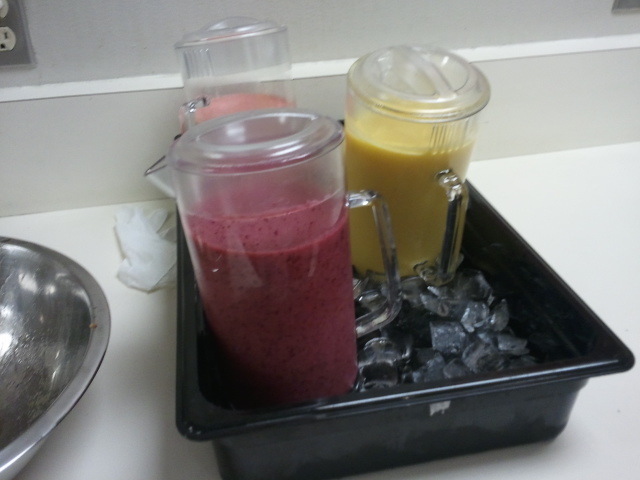 Every Wednesday at work, I make smoothies for one of our breakfast options. I used to work at this coffee shop back in Vancouver at a skytrain station. I had the pleasure of helping with making up ideas for the menu since it was a brand new coffee shop and the owners were amazingly enthusiastic about any new ideas. One of my favourite ideas that I contributed was smoothies. Now, anywhere I go, there’s a version of smoothies available whether it be fresh fruit or from a mix. Don’t get me wrong, I think it a great idea or I would’ve never suggested it but I find them always overpriced. It’s an amazing way to get fruits and dairy into our system and I love how portable it is. But at what $4 a pop or most places more for a decent sized cup, I’d much rather make them at home! For the same price point, I can make a whole jug of the nutrious goodness right at home in mere minutes! I find if you keep the smoothies in the fridge and don’t mind stirring it before drinking them, I can keep a jug in the fridge for about 3 days. I like sending the bf to work with one so he can have one as he is driving to work and I don’t have to worry about him ordering some breakfast sandwich instead. I would say here’s a recipe for a smoothie but honestly, it’s really up to your imagination to make it up. I could however provide you with a simple formula for it! Throw everything in a blender and volia! Fruit smoothie! Enjoy!